The holiday season is such a beautiful time of year. We are surrounded with twinkling lights, decorated trees, wrapping paper, wonderful music, and delicious foods. We take the time to embrace everything around us, so we should really do the same for ourselves. If everything around us is so beautiful, then we should feel and look beautiful too. Below are four holiday outfit ideas that you are sure to feel and look beautiful in.Try one, try them all. Remember to add some of your own pieces and to always mix and match items that you already have. Enjoy and embrace your beautiful selves this holiday season... it's the best gift you could ever give yourself. 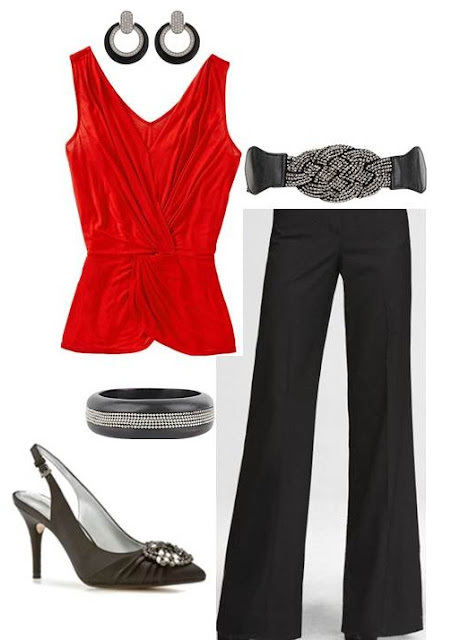 This outfit is perfect for work holiday parties or holiday dinners. Simple and classic. This red faux wrap top from Old Navy for $24.94 is extremely flattering on all shapes. Pair this flattering top with these luxury stretch editor wide leg pants from Express for $69.90. Again, very flattering on all shapes. To tie the outfit all together add this Forever 21 rhinestone belt for $10.80, black and rhinestone earrings from Forever 21 for $6.80, matching bracelet for $6.80, and these rich, slingback, Adrienne Vittadidini pumps at DSW for $69.95. This outfit is perfect for a holiday date with your sweetie or an upper scale work dinner. This H&M black satin bow skirt for $34.95 screams festive. Swap out your typical red, and pair this skirt with this fuchsia satin tie-shoulder top from Old Navy for $29.94. Pair with opaque black tights from Forever 21 for $7.80 and accessorize with these matching fuchsia Banana Republic earrings for $39.50, Forever 21 ring for $6.80, sparkling Forever 21 clutch for $28.80, and these killer suedette pumps from Forever 21 for $27.80. There is something so pure and feminine about wearing all cream or white, especially during the holiday season. Wear a beautiful red lipstick with this outfit... it will really make a statement especially since everything else is cream and gold tones. Find this cream lace dress with gold stitching at H&M for $34.95. Pair this dress with these metallic Forever 21 tights for $6.80, Payless cream and gold tone pumps for $34.99, and Aldo sparkling clutch for $35.00. Finish your pure look with a pearlescent and rhinestone necklace from Forever 21 for $12.80 and rose rhinestone studs for $2.80. The perfect holiday go to outfit. This holiday outfit truly is a good fit for anything that you have going this holiday season. 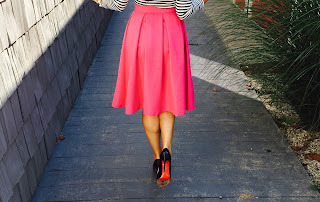 Find this vintage style red pin skirt at Francesca's Collections for $28.50. Pair this skirt with this lace trim top from Old Navy for $29.94 and add that extra "wow" with a statement necklace like this one above from Forever 21 for $12.80. Pair with matching earrings from Forever 21 for $1.50, and finish with these sleek faux suede heel boots from Charlotte Russe for $40.00. Pull the entire outfit together with this fabulous beaded fringe clutch from Forever 21 for $19.80. Holiday Outfits Are a Hit!